Pontoon 2-Quart Bedpans have a weight capacity of 250-pounds. Pontoon styled bed pans are strong, solid, and contoured for patient comfort. 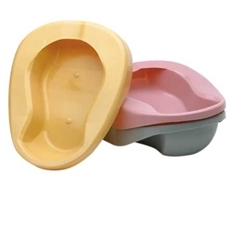 The front rim can easily be used as a handgrip for stabilization and removal of the bedpan. They have an ID area for patient name, room number, bed, etc. The rear overhang allows for added capacity while containing contents during transport.